Sakthi Auto Component Limited is one among the MULTI FACETED Sakthi Group situated at Mukasi Pallagoundenpalayam, Erode District, Tamilnadu State, India, established in the year 1983. Presently the Sakthi Auto has a capacity to produce 24000 Tonnes / annum of S.G.IRON Castings, on a 100 Acre Land with all amenities for Workmen and Officers like Housing, Transport etc. Sakthi Auto is one of the major producers of S.G.Iron Castings, meeting the needs of most of the Automotive and other general Engineering Industries. Supplying most CRITICAL COMPONENTS like STEERING KUNCKLE, BRAKE DRUMS and MANIFOLDS for all Suzuki Vehicles Manufactured in India by M/s. Maruti Udyog Limited at New Delhi & to many leading passenger car manufacturers in fully machined condition. R&D Lab is attached to our Sakthi Auto with modern computerised equipments like Direct Reading Spectrometer, Carbon Sulphur determination, Universal Testing Machine, Scanning Electron Microscope, Industrial X-RAY Scanner etc. Sakthi Auto is equipped with DISAMATIC FOUNDRY with the state of the art manufacturing technology which is regarded as the best anywhere in the World. And equipped with many sophisticated special purpose and CNC machines to produce precision oriented component for passenger car and automobile industries. 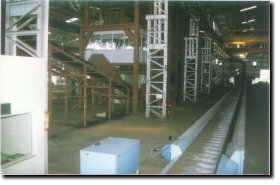 The Moulding line which has been supplied by M/s. DISA Technologies of DENMARK, is one of their latest and most efficient moulding line. It has the capacity to produce 440 flawless moulds / hour. This would ensure closer tolerance and low rejection rates. It has Automatic Pouring Unit procured from M/s. Asea Brown Boveri Ltd. and it maintains the consistency in the metal temperature. Technical collaboration for melting technology has been entered into with M/s. +GEORGE FISHER+ FOUNDRY SYSTEMS, SWITZERLAND, who are the world leaders for Manufacturing various precision components for the Automobile Industries.